It’s been 50 years since the first Boeing 747-100 took off over Seattle on its official maiden flight on February 9th, 1969 – to the cheers of thousands of spectators. The Boeing 747-100 was the largest jet airliner the world had ever seen. The success story of the Boeing 747 aircraft family started in the mid-60s, when Boeing developed a wide-body jet as an answer to the growing aviation needs. After less than four years of planning and development, in which Lufthansa engineers also took part, the jet, built from around six million individual parts, was ready to take to the skies. The first Boeing 747-130 with the Lufthansa registration “D-ABYA” carried the production number 12. The “Yankee Alpha”, as it was called within the company, was handed over to Lufthansa on March 9th, 1970 and was deployed on the Frankfurt-New York route for the first time on April 26th, 1970. Lufthansa was the first European airline to provide its passenger the opportunity to fly by Jumbo Jet, being the second international airline following Pan American World Airways (PanAm). The excitement of the passengers and crew on board was immense. Right from the entrance point to the jet, one gets into a “celebrative champagne mood”, a journalist wrote at that time. Hardly surprising, when considering that there was a bar in the First Class Lounge on the upper deck of the aircraft. To this day, the “hump” of the Boeing 747, which houses the cockpit and upper deck, remains the distinguishing feature of the Jumbo Jet in comparison to all other types of aircraft. The silhouette of the Boeing 747 has shaped the jet age and is still a style icon for many aviation enthusiasts. The Boeing 747, with almost 70 meters in length and a span of nearly 60 meters, was christened by the American press as “Jumbo Jet”, offering space for 365 passengers at Lufthansa. The height of the tail unit, approximately 19 meters, was higher than a five-story building. The aircraft had a four-engine wide-body. These engines achieved more than twice the performance of a Boeing 707, which had previously been used on long-haul flights in intercontinental air traffic, but could only accommodate about 150 passengers. Before accepting its first Jumbo Jet, Lufthansa had to adapt its aircraft and passenger handling so that they could cope with the different dimensions of the aircraft. New passenger boarding bridges, special tractors, kitchen lift trucks and tanker trucks were all developed at Frankfurt Airport, including a 27,000 square meter aircraft hangar with space for up to six Jumbo Jets. In addition, further counters had to be made available in the check-in hall. 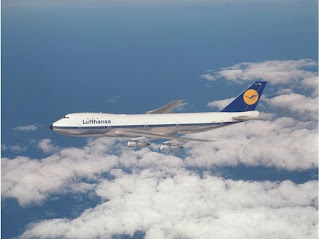 After Lufthansa had also operated its successor models (the 747-200 and 747-400), Lufthansa was the world’s first passenger airline to receive the first Jumbo Jet’s “grandson”, the Boeing 747-8, on May 2nd, 2012. The modern aircraft can accommodate up to 364 passengers in First, Business, Premium Economy and Economy Class. It consumes just over three litres of fuel per passenger over 100 kilometres and has 30 percent lower noise emissions than its predecessor. When Lufthansa unveiled its new brand look about a year ago, a Boeing 747-8 was the first aircraft to be presented in the new livery. Like the first 747 aircraft 50 years ago, this machine is called “Yankee Alpha”, too. The Jumbo Jet did not only have a career as a passenger aircraft. In March 1972, Lufthansa took on the world’s “first smiling Boeing” – the freight version, the Boeing 747-230F. Its prow opened up horizontally, making it easy to load even bulky goods. The Jumbo Jet was nicknamed the “Beetle swallower”, as it had space for 72 VW Beetles in its fuselage.